It's a method of controlling the speed of a train down a long grade without pi**ing away your air or heating up the brake shoes excessively. 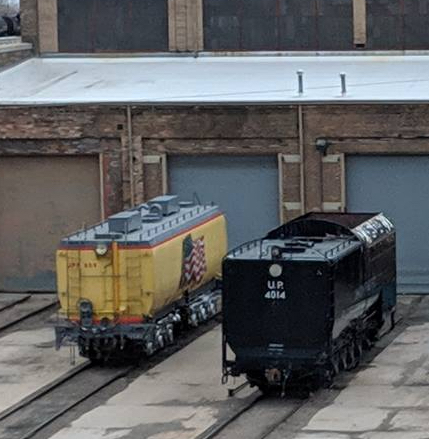 Photo from the steam shop yesterday 4/17/19 showing the tender waiting outside. Oh no!! Maybe they already did and it’s sitting outside with 4014 painted on it!!! Hard to tell from the picture, but it looks like a empty coal bunker in the tender. Exactly, you can clearly see the empty coal bunker. Makes sense, it was already configured to haul oil. They can change over 4014's tender later from coal whenever they feel like it. Good chance this is a temporary solution. You can see the time crunch the crew is on right now; if they spend more time converting the 4014’s tender to oil, it may not be ready for the celebration. 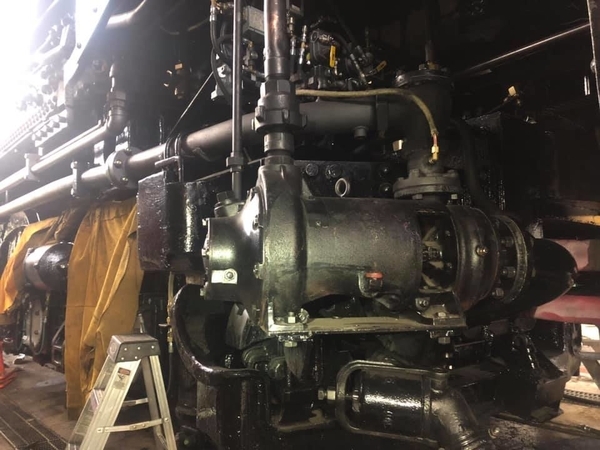 More progress photos posted 4/18/19 to the FB UP Steam Club Page. "...Big Boy's rebuilt air brake system and the cold water turbine that delivers water from the tender to the Elesco TP503 exhaust steam injector. "The cold water turbine was designed for a 4000-class locomotive to deliver massive water quantities to the Big Boy’s boiler. 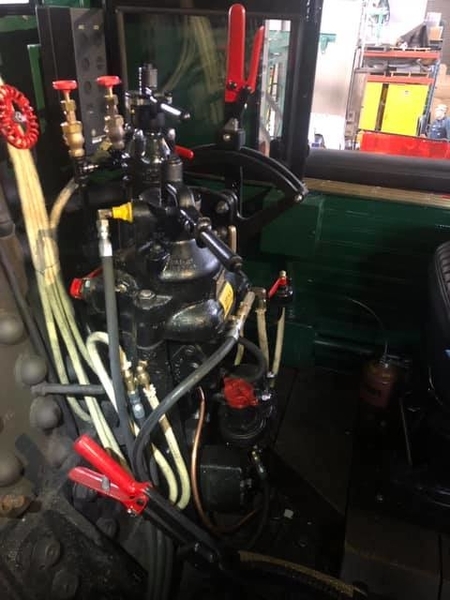 In the upper-left corner you can see the fuel line running along side the firebox." What is the green box with the push button? That's the ejection button in case one of the critics of the UP Steam Program enters the cab. Some people say the critics deserve it; others say the UP steam director has no way to deal with them logically, so he has resorted to this extreme method. Cab signal acknowledgement button? 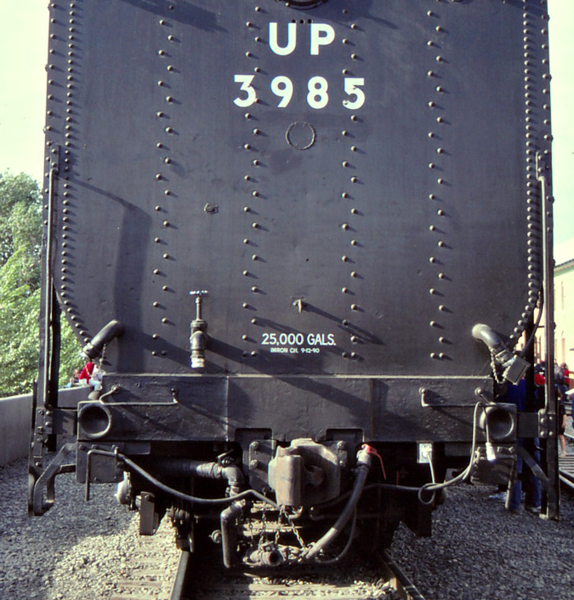 I recall Steve Lee in some video somewhere talking about how the 844 had a little lever in its cab that he had to flip whenever the signals changed otherwise an audible warning sound would continue to go off. 2 more appliances stripped off 3985. Here's a photo from when she was on display in CA, and the brake equipment was all there and intact. There is nothing "new" in that air brake setup. That's an old #8 air brake system. Parts for that system are no longer made, stocked or even cared about. I hope UP has a good stock of #8 brake valve parts on hand, because no one else has any. Almost every other steam locomotive operator in the country has changed over to a modern, pressure maintaining, #26 air brake system. Replacement 26 brake valves are available in every diesel shop in the country. Using this old air brake system makes no sense to me at all. Unless it matches your other old number 8 brake systems in your other locomotives and you have an adequate stock of extra parts. I'll be honest here from a neutral look at this venture taking out emotion and other issues and just looking at the factual evidence unrelated to specific people in or out of the UP organization. UP wanted for whatever reason (not debating this as it's irrelevant to the point) to restore a Big Boy. There are many logistical and financial issues with undergoing this. There are also to cost paths. The first cost path was the restoration of the BB to oil fired with a full conversion of all systems. This would require manufacturing and procurement of all components with a cost likely well into the 10's of millions of dollars territory. The second cost path as to gut usable components out of a successfully operating and very similar 3985 to convert and operate the BB. This path significantly reduces cost, time, and I believe most significantly risk to the venture. We all know which path as chosen which brings me to my main point. The issues with the first path still exist if 3985 is to run again. 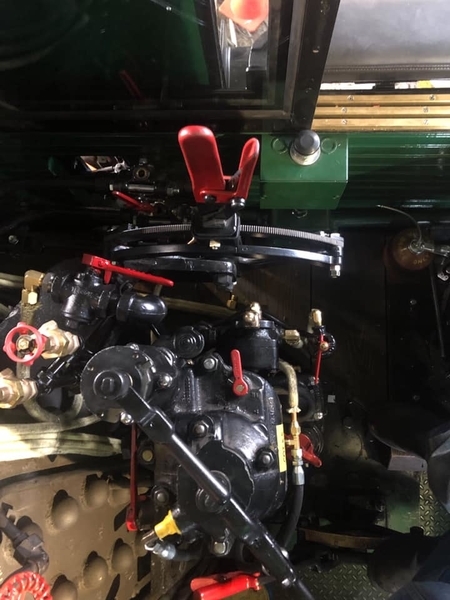 There is also a compounded cost factor of operating not 2 but 3 steam locomotives for a company which is currently going through major cost reduction projects across the line. While operating even one steam locomotive by a class 1 RR is an anomaly, 3 is like a unicorn with two of those being large articulateds more like the mythical chimera. From non emotional standpoint looking from the outside, one can see why as an organization UP would restore and operate in heritage what was their largest most powerful steam loco ever, one of the most powerful in the world ever, and will be the largest and most powerful steam loco in operation in the world. This brings me to my conclusion and prediction of two scenarios. Both scenarios are that 3985 does not run again and instead is put on display somewhere with the 4014 tender repainted to 3985. Scenario one includes running the BB mostly as a show using diesel power as the real motive behind it. This would greatly reduce operational cost, maintenance, and risk. 844 may or may not be run as often and will double head for big events. Scenario two is much like one using diesel power however 844 gets quietly sidelined (basically retired) but kept in operational condition just in case of BB issues or failure. In this scenario 844 could come out as a BB stand in but again utilizing diesel for the work. From what I see I have doubts as to whether to purpose of converting to oil was for full operation, or more because it was easier to source and fire in a way to create a show. This plays into a lot of what's seen in the process. I haven't heard yet, but anyone know if the diesel MU stand will be installed and operational? The first cost path was the restoration of the BB to oil fired with a full conversion of all systems. This would require manufacturing and procurement of all components with a cost likely well into the 10's of millions of dollars territory. No, not even close. Low six figures or less would probably be plenty to finance a conversion to oil fuel. There isn't that much to it. Santa Fe switched engines back and forth from coal to oil to coal almost like it was a bodily function. The use of #3985's tender I'm told was only for expedience for this year. Building an oil tank to drop into the coal space is something that any decent fab shop can do in a month or two, and UP has the blueprints. I understand that #4014's tender also needs running gear work. The second cost path as to gut usable components out of a successfully operating and very similar 3985 to convert and operate the BB. This path significantly reduces cost, time, and I believe most significantly risk to the venture. Maybe, but I'll bet $0.05 not. We all know which path as chosen which brings me to my main point. I don't, because I haven't been to Cheyenne to look over #3985, have you? The issues with the first path still exist if 3985 is to run again. There is also a compounded cost factor of operating not 2 but 3 steam locomotives for a company which is currently going through major cost reduction projects across the line. That's true. While operating even one steam locomotive by a class 1 RR is an anomaly, 3 is like a unicorn with two of those being large articulateds more like the mythical chimera. Both scenarios are that 3985 does not run again and instead is put on display somewhere with the 4014 tender repainted to 3985. Only time will tell. From what I see I have doubts as to whether to purpose of converting to oil was for full operation, or more because it was easier to source and fire in a way to create a show. The conversion was done for logistical practicality, and to reduce the fire hazard in the dry southwest. This plays into a lot of what's seen in the process. Watch history roll by, from Cheyenne. A video from Ed Dickens, Cheyenne. 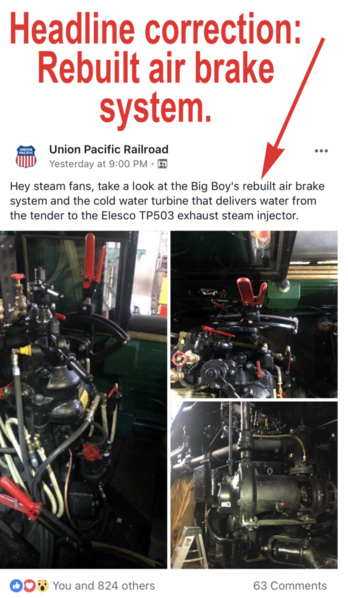 Just two short weeks from today, Union Pacific's historic steam locomotive, Big Boy No. 4014, will be revealed to the public. After five years of painstaking refurbishing, this beauty is going to be a sight to see! Here's a look back on how far it's come. This is the best video from the Steam Club that tells the complete history of the Big Boys & Heritage Operations at Cheyenne, Wyoming. Take a look, you will not be disappointed. Ok , just wondering. Both sides are interesting to me.